The Pulitzer Prize–winning historian’s “lively and absorbing” biography of Ulysses S. Grant and his leadership during the Civil War (The New York Times Book Review). This conclusion to Bruce Catton’s acclaimed history of General Grant begins in the summer of 1863. After Grant’s bold and decisive triumph over the Confederate Army at Vicksburg, President Lincoln promoted him to the head of the Army of the Potomac. The newly named general was virtually unknown to the Union’s military high command, but he proved himself in the brutal closing year and a half of the War Between the States. Grant’s strategic brilliance and unshakeable tenacity crushed the Confederacy in the battles of the Overland Campaign in Virginia and the Siege of Petersburg. In the spring of 1865, Grant finally forced Robert E. Lee’s surrender at Appomattox Court House, thus ending the bloodiest conflict on American soil. Although tragedy struck only days later when Lincoln—whom Grant called “incontestably the greatest man I have ever known”—was assassinated, Grant’s military triumphs would ensure that the president’s principles of unity and freedom would endure. 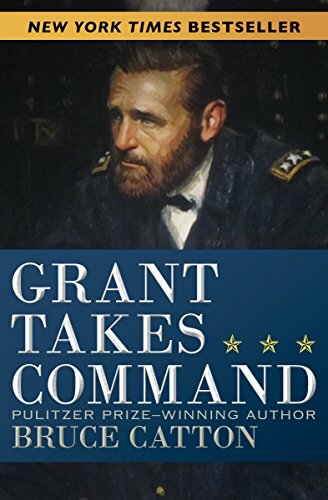 In Grant Takes Command, Catton offers readers an in-depth portrait of an extraordinary warrior and unparalleled military strategist whose brilliant battlefield leadership saved an endangered Union.